Another good entry of 450 store cattle and weanlings at Markethill on Saturday, February 2 continued to sell in a very firm demand with prices seeing a further increase on the week. 150 heifers sold in the firmest trade to date this year. Good quality heavy heifers sold steadily from £195 to £215 per 100 kilos for a 566k Limousin at £1,215 from a Ballynahinch farmer followed by £213 per 100 kilos for 608k Charolais at £1,295 from a Keady farmer. Top price heifer £1,475 for 716k Charolais £206 form a Cappagh, Co Tyrone producer. Good quality middleweights sold in an exceptionally good trade from £200 to a top of £268 per 100 kilos for 408k Limousin at £1,095 from a Lisburn farmer. The same owner received £229 per 100 kilos for 434k Limousin at £995. Second quality heifers sold from £175 to £190 per 100 kilos. 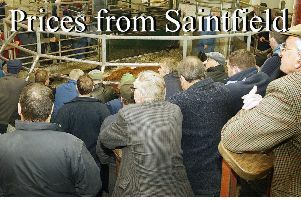 Ballynahinch farmer 566k, £1,215, £215.00; Keady farmer 608k, £1,295, £213.00; Cappagh farmer 614k, £1,295, £211.00; Cullyhanna farmer 532k, £1,105, £208.00; Cappagh farmer 716k, £1,475, £206.00; Portadown farmer 518k, £1,065, £206.00; Keady farmer 564k, £1,155, £205.00; Cappagh farmer 574k, £1,175, £205.00; Keady farmer 692k, £1,415, £204.00 and Ballynahinch farmer 522k, £1,065, £204.00. Lisburn farmer 408k, £1,095, £268.00; Lisburn farmer 434k, £995, £229.00; Killylea farmer 406k, £905, £223.00; Newry farmer 460k, £1,015, £221.00; Forkhill farmer 406k, £895, £220.00; Portadown farmer 402k, £885, £220.00; Forkhill farmer 468k, £1,025, £219.00; Newtownhamilton farmer 472k, £1,025, £217.00 and Forkhill farmer 404k, £875, £217.00. 140 bullocks returned a firmer trade. Good quality forward bullocks sold steadily from £200 to £224 for 538k Limousin at £1,205 from a Benburb farmer followed by £219 per 100 kilos for a 654k Limousin at £,1435 from a Dromore producer. Top price £1,555 for 760k Charolais £204 from a Keady farmer. Good quality middleweight sold from £195 to £223 for a 468k Charolais at £1,045 for a Portadown producer. Friesian bullocks returned a very strong trade with top quality Friesians from £140 to £162 for 502k at £815 from a Portadown farmer. Benburb farmer 538k, £1,205, £224.00; Dromore farmer 654k, £1,435, £219.00; Dromore farmer 534k, £1,170, £219.00; Keady farmer 736k, £1,565, £213.00; Benburb farmer 516k, £1,095, £212.00; Benburb farmer 536k, £1,115, £208.00; Benburb farmer 526k, £1,085, £206.00; Loughgall farmer 594k, £1,225, £206.00; Dromore farmer 576k, £1,185, £206.00 and Ballinderry farmer 686k, £1,405, £205.00. Portadown farmer 468k, £1,045, £223.00; Portadown farmer 454k, £995, £219.00; Keady farmer 444k, £965, £217.00; Keady farmer 476k, £1,025, £215.00; Keady farmer 444k, £955, £215.00; Keady farmer 450k, £965, £214.00; Benburb farmer 482k, £1,025, £213.00; Keady farmer 484k, £1,015, £210.00 and Portadown farmer 442k, £915, £207.00. Portadown farmer 502k, £815, £162.00; Dungannon farmer 574k, £875, £152.00; Ballynahinch farmer 512k, £745, £146.00; Dungannon farmer 622k, £905, £146.00; Dungannon farmer 574k, £835, £145.00; Ballynahinch farmer 574k, £830, £145.00 and Dungannon farmer 638k, £895, £140.00. 150 weanlings sold in an excellent trade. Light male weanlings sold to a top of £297 per 100 kilos for a 364k Charolais at £1,080 from a Richhill farmer followed by £290 per 100 kilos for 340k at £985 from a Richhill farmer. All good quality lightweights sold from £240 to £285 per 100 kilos. Stronger males sold from £200 to £288 for 410k Charolais at £1180 from a Richhill farmer. Good quality heifer weanlings sold from £210 to £282 for 314k Charolais at £885 followed by £281 for 318k Charolais at £895 both from a Richhill producer. Richhill farmer 410k, £1,180, £288.00; Ardglass farmer 414k, £980, £237.00; Richhill farmer 438k, £1,030, £235.00; Ardglass farmer 426k, £940, £221.00; Ardglass farmer 452k, £980, £217.00; Ardglass farmer 416k, £900, £216.00; Ardglass farmer 468k, £990, £212.00 and Markethill farmer 434k, £890, £205.00. Richhill farmer 314k, £885, £282.00; Richhill farmer 318k, £895, £281.00; Richhill farmer 320k, £865, £270.00; Jerrettspass farmer 372k, £1,000, £269.00; Dungannon farmer 316k, £800, £253.00; Richhill farmer 358k, £865, £242.00; Richhill farmer 394k, £935, £237.00; Richhill farmer 390k, £920, £236.00; Dungannon farmer 336k, £790, £235.00 and Richhill farmer 360k, £835, £232.00.